AirPura F600DLX Carbon Filter is AirPura oversize carbon filter with industrial strength adsorbent for AirPura F600DLX portable air purifier. AirPura F600DLX Carbon Filter is original OEM AirPura replacement filter for AirPura F600DLX air purifier. AirPura F600DLX carbon filter contains massive amount (26 lbs.) of industrial strength specialty adsorbent in 3-inch deep filter canister. AirPura F600DLX carbon filter is specially formulated to provide effective removal of Heavy Formaldehyde and VOCs. The F600DLX filter's extra thick 3-inch carbon bed extends the dwelling time and helps improve the overall adsorption efficiency. 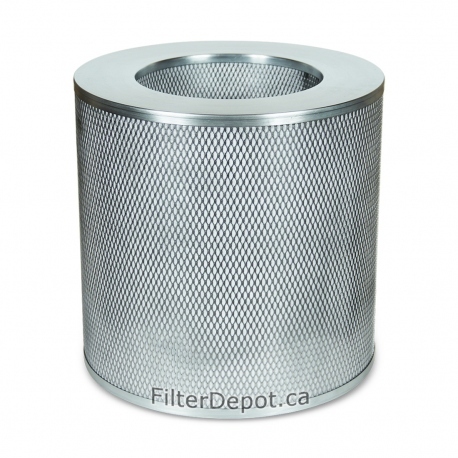 AirPura F600DLX carbon filter canister features the durable, non off-gassing the all metal construction. The F600DLX carbon filter's lifetime: 18 to 36 months.